This is 4th Nesting of this pair and always white eggs. 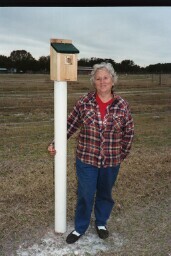 CLICK ON PHOTO ABOVE: You will see more of Leah's photos of her Bluebirds and boxes etc. Leah's photos are beautiful, take a look. Thank You Leah for your good work! Note: The above Bluebird nestings were stopped by a hawk taking out one of the parents. I do not remember if it was the female or male. If not the female she would have moved on to where her new mate was. I have not heard from Leah since this happened. H 1 Is starting with 10 boxes. They are using boxes made by Stokes. The predator guard is PVC over 2 x 4's. Mary's Trail went up way before her new house was finished being built. 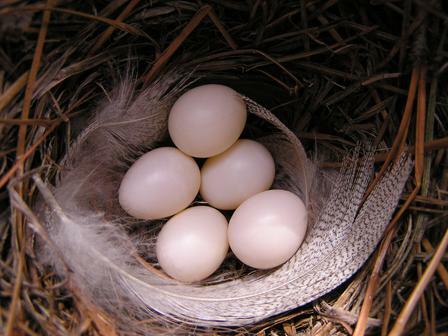 Her first year she found 7 eggs in one box. The next day only 6 were found. 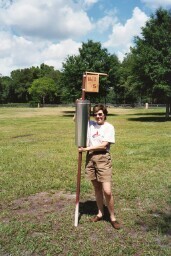 In 2004 just a few weeks after her home was finished she found her first BB nesting started. But, Mary was home sick and moving back to Alabama. Hopefully this Trail will be passed on to the new homeowner. This was the property where a herd of cows and bulls escaped from down the road, and came to investigate me as I was unloading her Trail. I was saved by a couple of local cowboys making a fuss, which caused a small stampede back to the cow pasture!